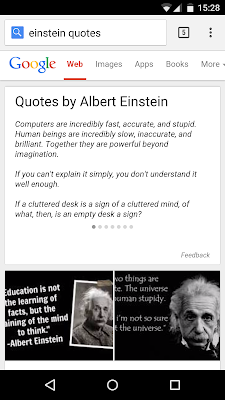 Google shows a card with a long list of quotes for searches like [Einstein quotes]. This works in the desktop interface and the mobile site and it's a quick way to find some quotations without visiting any search result. Here's the first quote by Albert Einstein: "Computers are incredibly fast, accurate, and stupid. Human beings are incredibly slow, inaccurate, and brilliant. Together they are powerful beyond imagination." It's worth pointing out that Google doesn't link to the sources. 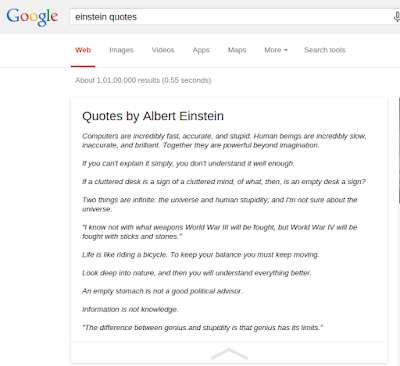 Quotes are extracted from various web pages and attribution seemed unnecessary for Google.